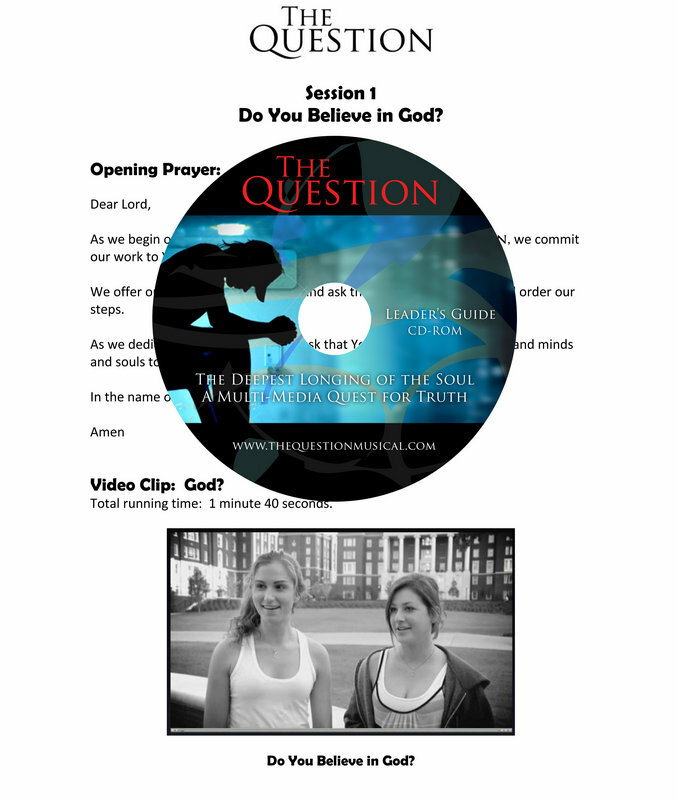 Everything you need to make The Question a success with your church or organization. For information or to place orders please Contact Us. 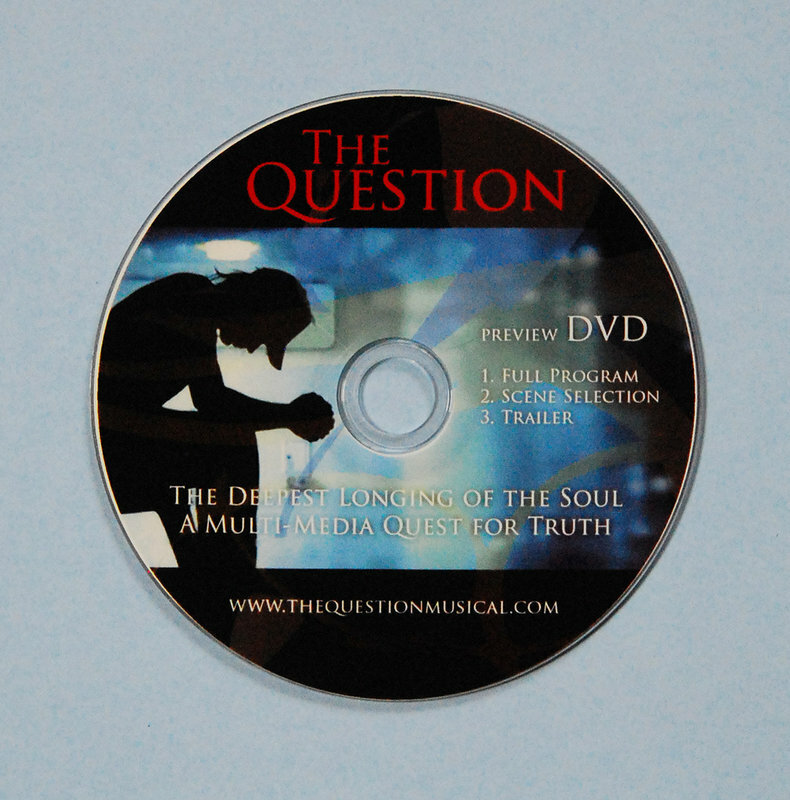 This disc contains the introductory video, accompaniment tracks/background videos for every song, the student street interview video segments, and a video testimony by Franklin Graham. The accompaniment audio tracks include Stereo and Split-Track versions, plus a Music Stems option using a DVD player’s 5.1 surround channels. Format: DVD-Video (plays in a DVD player). Recommended quantity: One (1) for the performance. May also be used for music rehearsal, but it does not have the rehearsal markers within the songs as on the Split-Track Music CD. Stems include bass, keyboards/pads, drums/loops and guitars. This disc contains split track music accompaniment tracks for each song, with demo vocals in the right channel and a mono music accompaniment track in the left, and markers for direct access to rehearsal points. 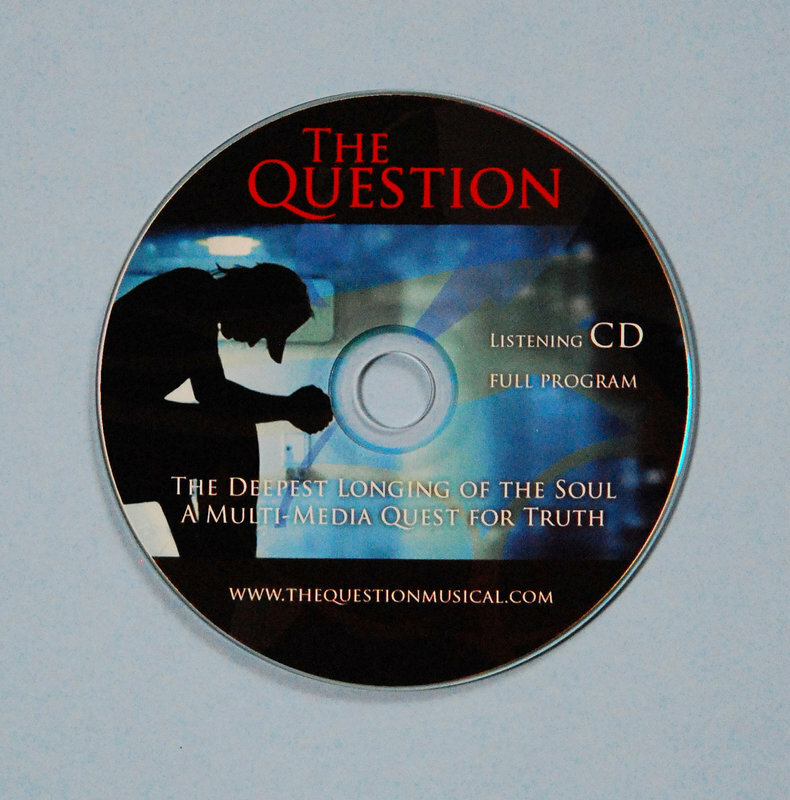 This disc does not contain the dramatic sketches, background videos or video segments. Format: Music CD Recommended quantity: One (1) for rehearsal (Accompaniment DVD may be used instead but it does not have rehearsal markers within the songs). This disc contains stereo music accompaniment tracks for each song, with no demo vocals, background videos or video segments. Format: Music CD (plays in any CD player or computer). Recommended quantity: One (1) for rehearsal (the Split-Track CD may be preferable. The Accompaniment DVD may be used also, but it does not have rehearsal markers within the songs). This disc contains band rhythm charts for every song in Adobe .pdf format so you can print the required number of charts for your band on your computer and printer. Format: Computer CD-ROM Recommended quantity: One (1) disc required if you will be using any live instrumentalists. Not required if you will only be using the Accompaniment DVD with no live instrumentalists. The .pdf rhythm chart files can be printed from any computer with the free Adobe Acrobat Reader program installed. Contains combined vocal and rhythm charts for all songs, complete scripts for all dramatic sketches, and cues for all video segments. 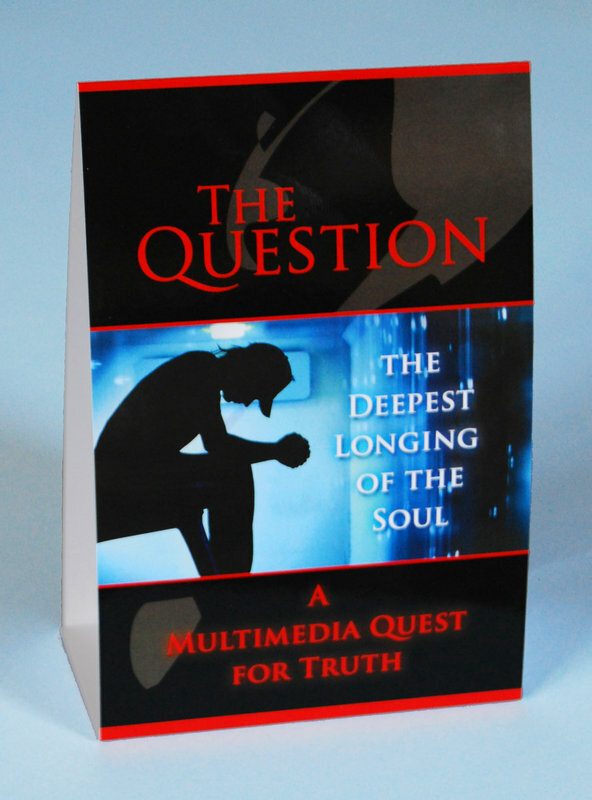 Help create awareness and anticipation for your performance of The Question by displaying these high-gloss full-color door knob hangers around the church. Format: 3.5X11 inches, heavy stock, high-gloss full-color. Recommended quantity: Enough to display throughout the church. One of the primary goals of The Question is to help train and equip the participants to be lifelong witnesses for Christ. The Leader Guide disc contains 13 training Sessions designed to begin the first 10 minutes of each rehearsal period. The focus of the Sessions is to help youth better understand their personal faith and become equipped to share their faith clearly, boldly, and lovingly. Each Session begins with a short video, dramatic sketch or group reading, followed by a time of discussion and scripture reading. Sessions may be shortened or omitted as necessary. Format: Computer DVD-ROM (accessible in any computer DVD disc drive). Playback of the .m4v video files requires a recent version of a free computer media player such as Windows Media Player or Quicktime. Recommended quantity: One (1) disc required. 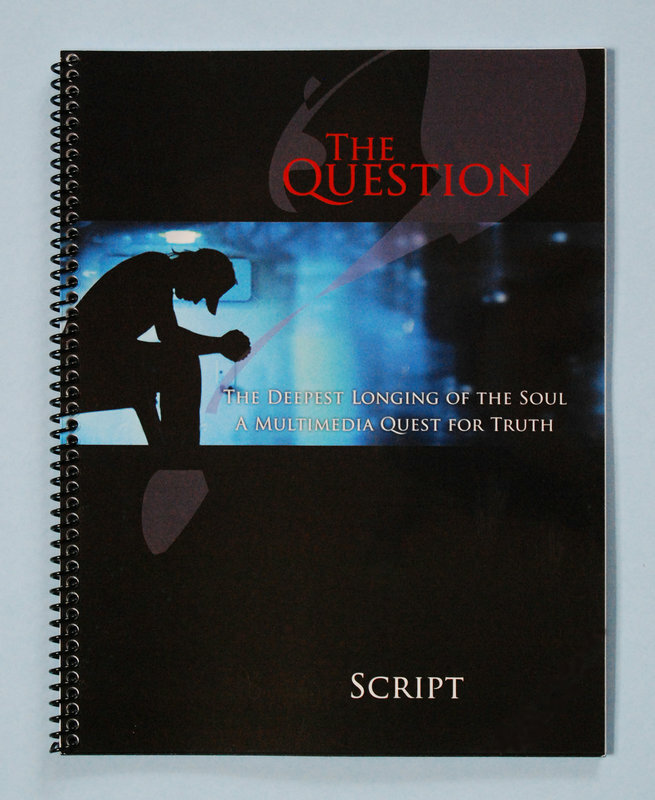 Copies of session materials and scriptures are in Adobe .pdf format and may be printed as needed. Contains recordings of every song with demo vocals and every sketch portrayed by acetors to help group members learn the songs and sketches. Also included is the audio from all the video segments. Format: Music CD (plays in any CD player or computer) Recommended quantity: One (1) for each singer, actor and crew member. 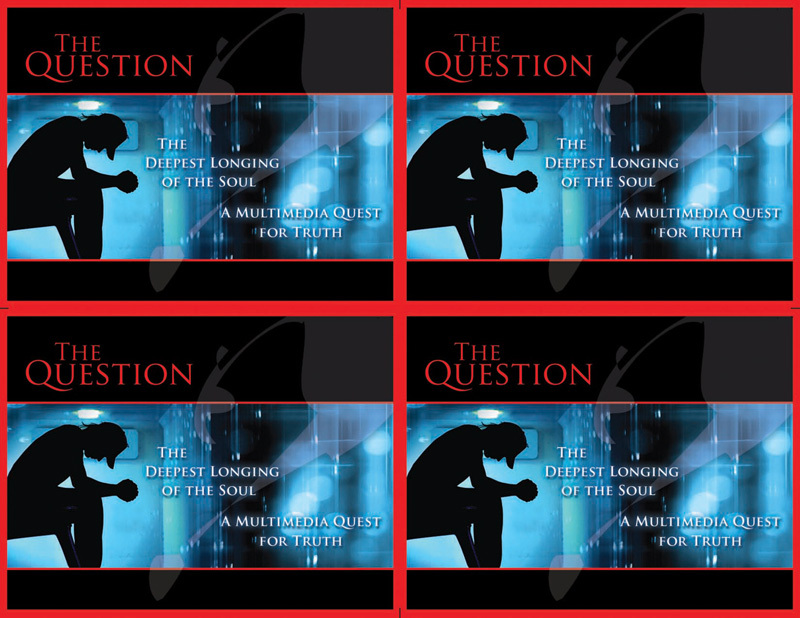 Available individually or in economical bulk packs of 10 or 50 CDs. Contains recordings of every song with demo vocals and every sketch portrayed by acetors to help group members learn the songs and sketches. Also included is the audio from all the video segments. These standard-sized sheets are printed with four (4) color post cards on one side, blank on the other. The color ink is safe to run through your laser printer so the blank side can be imprinted with the date, time and location of your performance of The Question, as well as address labels for mailing. After the blank side is imprinted, simply have the sheets cut into four separate post cards at a local quick-print shop. 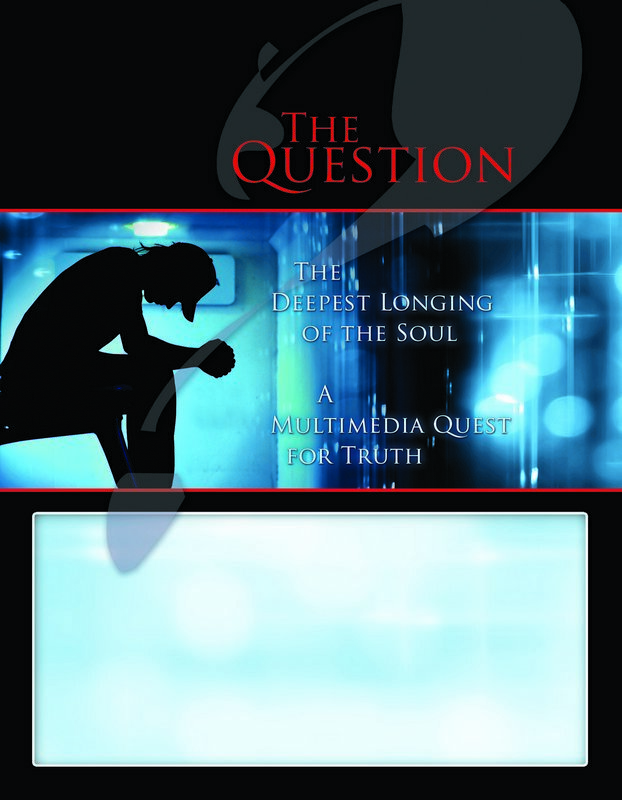 Format: 8½ x 11 inches, high-gloss full color one side, blank on the reverse. A package of 100 sheets will produce 400 post cards. Recommended quantity: One (1) for each person on the church mailing list, plus additional cards for evangelistic outreach. 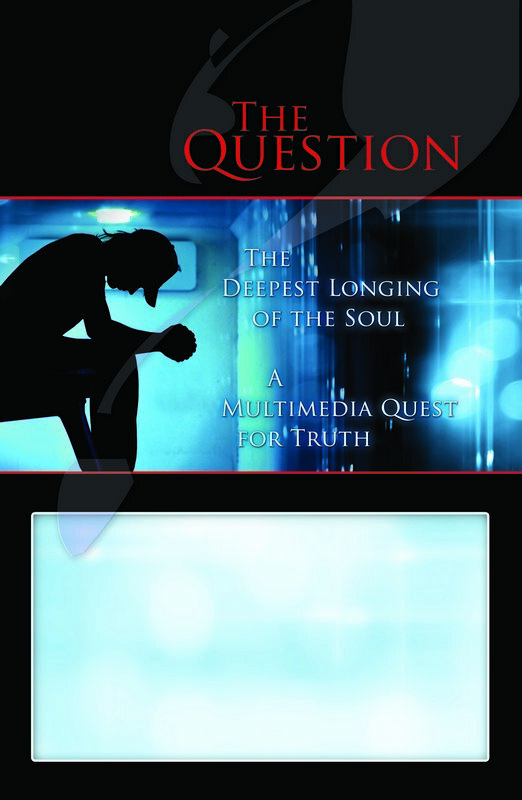 Help create awareness and anticipation for your performance of The Question by displaying these high-gloss full-color posters throughout the church and around your community. Format: 11 x 17 inches, full-color. Recommended quantity: Several to hang around the church, plus additional posters to display throughout the community in store windows, schools, businesses, etc. Available in economical bulk packages of 20 posters. Format: 8½ x 11 inches, full-color. Recommended quantity: Several to hang around the church, plus additional posters to display throughout the community in store windows, schools, businesses, etc. Available in economical bulk packages of 20 posters. 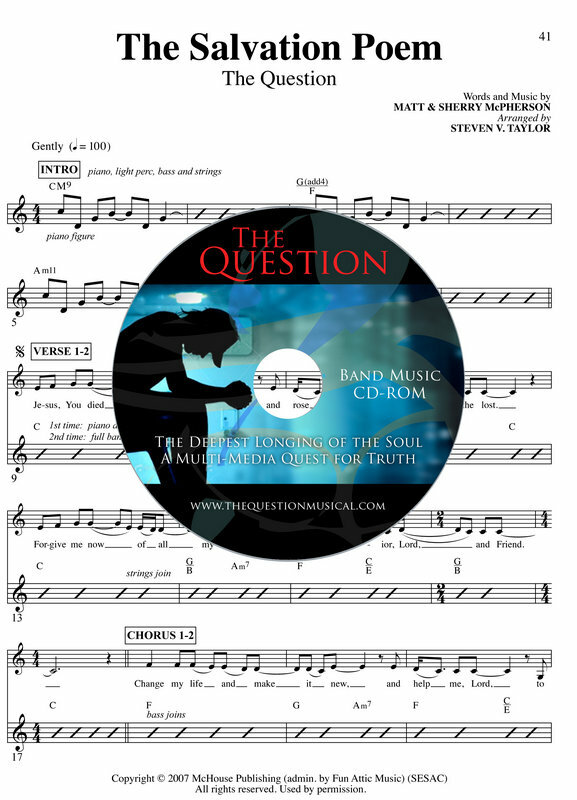 This kit includes a Vocal Music Book, a Preview DVD with the full program, including all songs, dramatic sketches and videos, a Listening CD, a sample of The Salvation Poem Card, an overview of The Question presentation, and other information to help you evaluate the project. 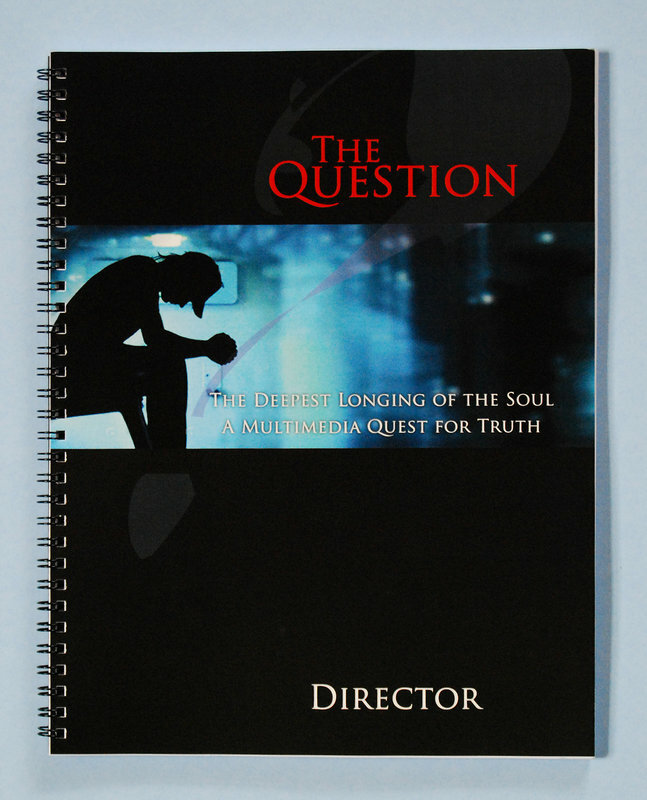 Contains full scripts for all dramatic sketches, plus lyrics for songs and cues for video segments. 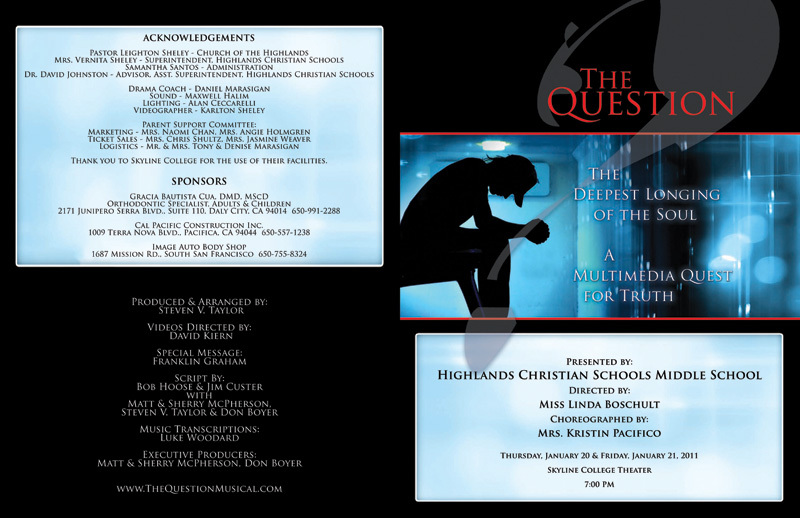 Help create awareness and anticipation for your performance of The Question by displaying these high-gloss full-color table tents on tables and other horizontal surfaces throughout the church. Format: Folds to a 4 x 6 inch tent, heavy stock, high-gloss full-color. Recommended quantity: Enough to display throughout the church (lobby, foyer, fellowship hall, classrooms, etc.). 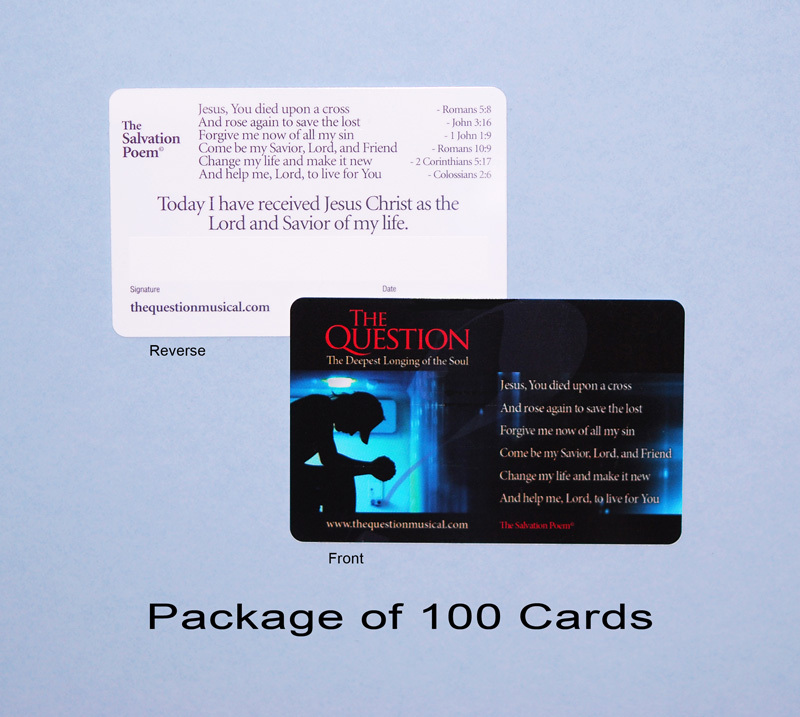 These durable cards present The Salvation Poem, a poetic and musical summation of the Gospel which serves as the core theme of both The Question presentation and the training Sessions (found in the Leader Guide). The cards are easily carried in a wallet or purse and will serve as a long-term evangelism aide for sharing the Gospel with others, as well as a reminder of God’s amazing grace toward humanity. Format: Durable synthetic card stock, 2⅛ x 3⅜ inches (similar in size to a debit card or driver’s license to easily fit in a wallet or purse). Recommended quantity: A minimum of one (1) for each participant in the presentation and one (1) for each person expected to attend the presentation(s), plus additional copies for evangelistic outreach. Available in economical bulk packages of 100, 500 and 1,000 cards. 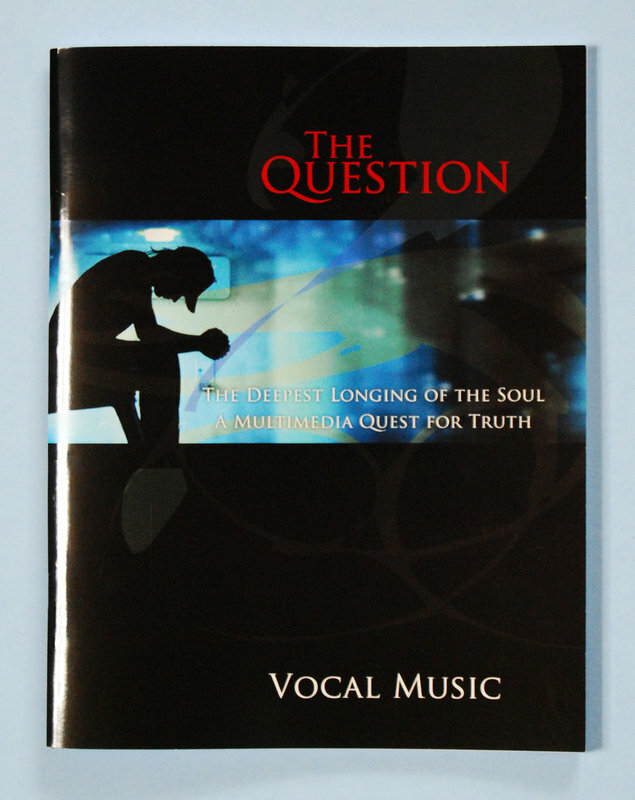 Contains vocal charts for all songs, plus cues for dramatic sketches and video segments. Format: 8½ x 11 inches, saddle stitched, 59 pages. Recommended quantity: One (1) for each singer.